Otto, Mary L., 88, Bellevue, formerly of Lincoln and Wausau, Wis.
LINCOLN -- Virgie Viola Van Fossan, 95, died Thursday, Aug. 11, 2005, at 6:40 p.m. at Lincoln Christian Village. Visitation will be from 5 to 8 p.m. Monday at Fricke-Calvert-Schrader Funeral Home in Lincoln. Her funeral will be at 10:30 a.m. Tuesday at Fricke-Calvert-Schrader in Lincoln, with Tim Searby officiating. Mrs. Van Fossan was a cook at Elkhart High School for 12 years, worked in housekeeping at Lincoln Christian Village and worked in sales and service at Lincoln Vacuum. She was born April 1, 1910, in Vandalia to Edward Martin and Grace Weddel Rhodes. She married George Elwood Van Fossan on Nov. 3, 1928, in Lincoln. He died March 23, 1975. She is survived by two sons, George Leroy (and Sarah) Van Fossan of Benton and Claude Elwood (and Carla) Van Fossan of Lincoln; nine daughters, Freda Lavon White of Decatur, Gladys Marie (and Bailey) Elkins of Lawndale, Helen Edgell (and Robert) Hoagland of Lincoln, Laura Mae (and Kenneth) Molt of Lincoln, Ethel Irene (and Jerry) Overbey of Beason, Margaret Ann (and David) Edwards of Beason, Rose Mary Musick of Lincoln, Sharon Kay (and Jim) Follis of Lincoln and Jean (and Harold) Boyer of Lincoln; 24 grandchildren; 46 great-grandchildren; nine great-great-grandchildren; and one sister, Geneva Hamil of New Holland. She also was preceded in death by one son, one grandson, one granddaughter, one great-grandson, one great-granddaughter, four brothers and three sisters. Memorials may be made to West Lincoln-Broadwell School District 92. Click here to send a note of condolence to the Van Fossan family. 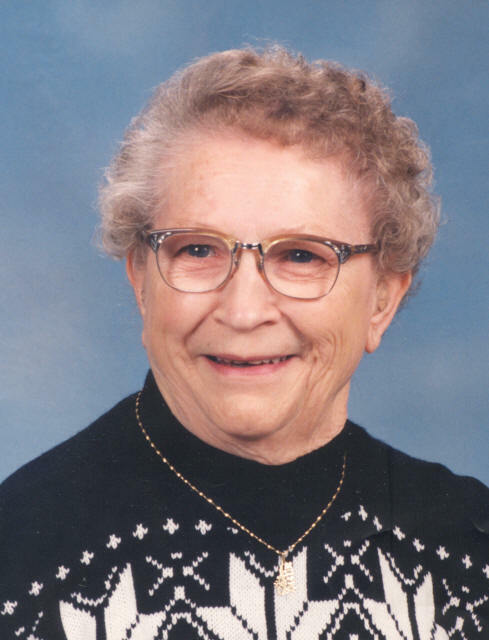 BELLEVUE -- Mary Louise Otto, 88, of Bellevue, formerly of Lincoln and previously of Wausau, Wis., died Tuesday, Aug. 9, 2005, at OSF Saint Francis Medical Center in Peoria. Her funeral will be in Bartonville at 1:30 p.m. Sunday at Davison-Fulton Funeral Chapels, 1203 W. Garfield Ave.. Visitation will be for one hour before the service. Burial will be at 1 p.m. Monday at Camp Butler National Cemetery, Springfield. Mrs. Otto retired from state employment at the Lincoln Developmental Center in Lincoln. She was born Feb. 23, 1917, in Merrill, Wis., to Hugh Francis and Mary Louise Parmer Nugent. She married Harvey J. Otto on Dec. 16, 1938, in Wausau, Wis. He died June 2, 2000. She is survived by a daughter, Karen L. (and Bill) Cole of Peoria; a son, Wayne K. "Gus" (and Nancy) Otto of Lincoln; five granddaughters, Cheryl Miller, Kelley Pearson, Shannon Engelmann, Amber Otto and Heather Otto; four great-grandchildren, Ryan Pearson, Cole Gallagher, Kayla Miller and Zachary Engelmann; three step-grandsons; and five step-great-grandchildren. She was also preceded in death by two brothers, three sisters and a son-in-law, Donald Gallagher. She was of Irish descent and the Catholic faith. An avid sports fan, she enjoyed tennis, basketball and football, but her heart belonged to the Green Bay Packers. She enjoyed spending time with her family and her dog, Charlie. Memorials may be made to the Children's Hospital of Illinois at OSF Saint Francis in Peoria.